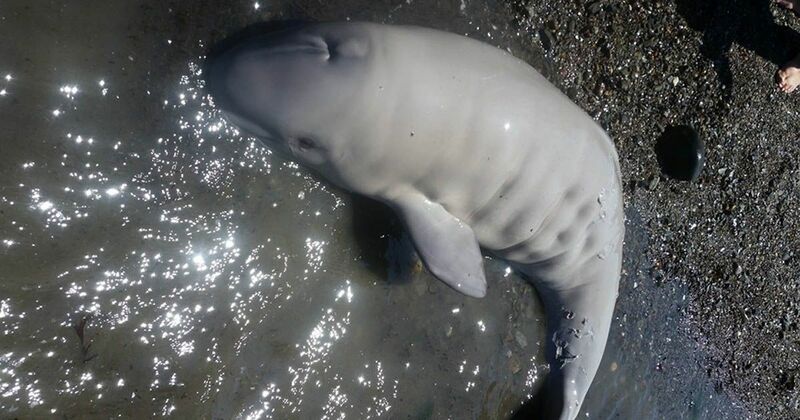 A newborn beluga whale is desperately in need of a new mom after being found by a family vacationing in Rivière-du-Loup, Quebec. Likely to have been only hours old when it was found by 15 year old Nicholas Milliard and his brothers, the youngster still had it’s umbilical cord attached, as it lay on the shore of the St Lawrence River. "We dug a hole so that water would accumulate and its skin would hydrate," Milliard told CBC News. As well as pouring buckets of water over the stranded calf, the family also used a sheet to shade it from the sun. Josiane Cabana, a spokesperson for the Group for Research and Education on Marine Mammals (GREMM) believes that the stricken orphan is in good health but it’s chances of survival depend on adoption by another female. "Belugas have to nurse for two years, so she really has to find a lactating female that will feed her milk for those two years," Cabana said. Petit film de notre périple de cet après midi. Qu'elle moment de bonheur d'avoir aider une vie. The calf was taken back to the water where it was accepted into a new pod with matron whales, but they showed no interest in nursing. The youngster then left to join another passing pod, at which point the research team lost sight of their charge. Although DNA samples were taken from the umbilical cord, researchers accept that they may never learn the young whale’s ultimate fate. Thanks to the actions of Nicholas Milliard and his family, at least this troubled baby beluga has a second chance of survival.